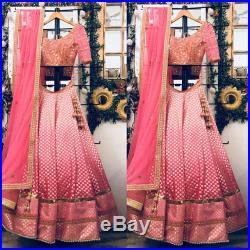 Pink embroidered heavy lehenga and choli. The lehenga choli is a custom made garment which include the blouse, lehenga(skirt) and the dupatta (stole). Skirt fabric is chanderi, blouse is in silk and stole material is soft net. Upon order confirmation, we will send you the measurement form which you will need to fill in inches so it is made to your size. 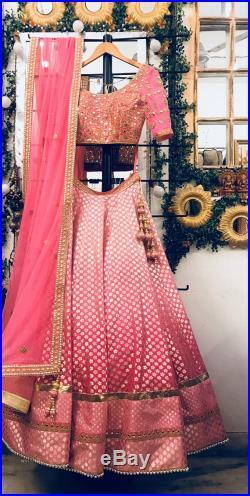 Blouse or lehenga length can be made according to your measurements, it can be shorter or longer. Care-dry clean onlythere might be slight variation in the color of the product and the design due to digital photography and different computer resolutions. The image if only for reference.